We are happy to announce that Frank Juarez, founder, will be presenting on the 365 Artists 365 Days Project this fall and upcoming spring. What started as a one-year project grew into a two-year project ending in 2015. Since then we were unsure what direction this project would take us. Juarez knew that this project has potential and was fortunate to present on this project at the National Art Education Association 2015 Convention in New Orleans, Louisiana and the 2015 Wisconsin Art Education Association Fall Conference in Appleton, Wisconsin. Most recently, he will be co-presenting with Elyse Lucas, Appleton art educator at the upcoming 2016 WAEA Fall Conference in LaCrosse, Wisconsin as well as the 2017 NAEA Convention in New York in March. Elyse attended one of his past sessions on this project and have used the artists’ database from this project with her high school art students. Below is a description of their presentation. 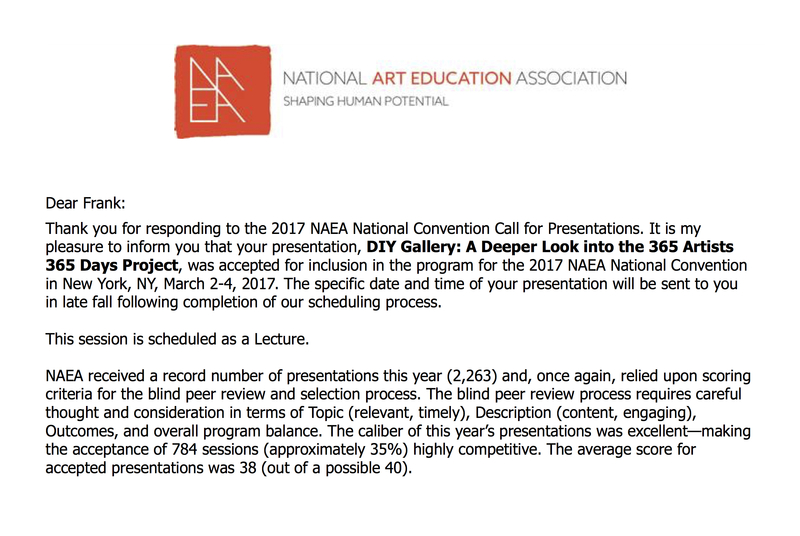 This session shares a story of how a Wisconsin art teacher created a very unique art lesson by implementing the 365 Artists 365 Days Project into her curriculum. The DIY Gallery: A Deeper Look into the 365 Artists 365 Days Project inspired her high school art students to research, collaborate, and to design their own mock up art galleries. Their journey led them to organize and curate a real exhibition in North East Wisconsin with artists from this project. This presentation will discuss how the idea of creating a DIY Gallery started, how it brought two arts professional into the conversation, importance of educating students on the logistics of putting together a successful exhibition, how to work with artists, and to network with local businesses/gallery owners to determine a possible venue for a student led art exhibition. The 365 Artists 365 Days Project highlights contemporary artists from across the globe through an online interview platform. Since its inception in 2014, it has introduced artist on a daily basis via online and social media. To date, it has featured over 700+ artists working in various media, processes, and studio practices. The session will be set up as a two­-person presentation; the Wisconsin art teacher and the founder of the 365 Artists 365 Days Project. A PowerPoint will be shared with the audience containing student testimonials, video, examples of students’ promotional designs, and Q & A. In addition to the project’s website, excerpts from Edward Winkleman’s How to Start and Run a Commercial Art Gallery will be implemented into the student led DIY Gallery lesson plan. Appleton art teacher, Elyse Lucas collaborated with Kate Mothes of Young Space inspires high school art students to research, collaborate, and design their own gallery. The 365 Artists 365 Days Project provided students with a list of artists whose works were explored for the curation of the exhibitions that were organized within their own galleries. It is such a rewarding experience to see this project inspire students to look at the [art] world through a different lens. The 365 Artists 365 Days Project is pleased to announce that it has made its 2014 and 2015 Artist Database available for download. These databases lists all of our featured artists from all over the world. The purpose of this project is to introduce its readership to a diverse collection of art that is being produced at the local, national and international level. The goal is to engage the public with content regarding a wide array of creative processes, studio practices, and the successes and challenges that artists face from day to day. Frank Juarez, Zina Mussman, and Rachel Quirk hope that this project can become a source for exploring and experiencing contemporary art in all its forms. We encourage you to share this project with students, educators, and professors. Anyone you think would be interested in Contemporary Art. and categorizes our artists working in a specific medium/a within our database. Please note: the downloadable file(s) are Excel spreadsheets. We categorized all of the artists’ work based on the type of work they submitted to our project. To download our 2014 Artist Database click here. To download our 2015 Artist Database click here. Questions can be directed to Frank Juarez at frankjuarezgallery@gmail.com. My studio practice revolves around confronting issues of safety, vulnerability, and perceptions of danger and anxiety. I make mixed media drawings that reflect the unease of contemporary existence and my own state of mind. In these drawings, I depict figures who are dressed in protective clothing in an environment that contains no discernable hazard. Lately I have been incorporating abstract floral shapes derived from my research into plants that are toxic to humans, some of which were often used in Victorian art to symbolize impending doom or a threating situation. I come from a very loving family who were also prone to worry and often overcautious and guarded as a general way of life. I grew up believing that there was danger lurking around every corner. This upbringing, combined with what I believe is a biological “nervous disposition” in myself, has turned me into a pathologically anxious individual. I have come to realize that this way of seeing the world is more common that I once thought. I believe that this constant state of fear is the way that we as a society have come to conceptualize our own existence. My studio practice consists of research, which can be conducted anywhere from my couch to simply walking down the street and observing. However, I value every moment I can spend within the walls of my studio; it has become a place where I can retreat, think and mostly importantly focus. I never thought I would run a gallery. 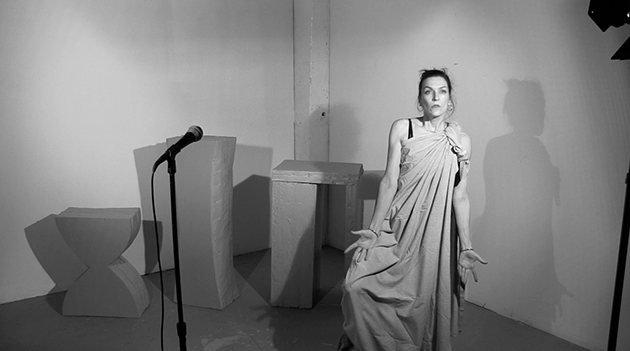 In 2011, Rachel Quirk and I rented a space that we intended to be a studio. We started to have open studio events and eventually renovated half of it into a formal exhibition space. We now show local and national artists. I didn’t picture myself teaching because I have always considered myself somewhat of an introvert. When I’m in the classroom, however, I become extremely extroverted. I love working out ideas with students and helping them realize their goals. Co-directing a gallery and teaching have made me grow and flourish as an artist. All three of these things inform and strengthen one another and I feel very lucky to be able to do them all. I used to make art whenever my crazy schedule would allow. Recently, I have decided that it is important to me to set aside specific times and days just for studio work. This work started out by me passing time while waiting for some painting surfaces I had prepared to dry. I used to paint with oils and was very particular about my surfaces, so I would devote entire days to just getting things ready. I had some photos and started playing around by drawing from them, using inks and watercolors that were laying around in the studio. Painting has fallen by the wayside, and my practice is entirely mixed media. I also feel that I have gotten mixed- media to work better conceptually than I ever could with painting. I am now incorporating cut-out elements into the work, which is something I experimented with early on, but could not get to function the way I wanted to. It is my experience that my work evolves when it is ready, and I think it seems ready for this. The Existential philosopher, Soren Kierkegaard’s themes of dread, anxiety, alienation, individuality and subjectivity has also had an impact on my life and work. I’m always drawn to people that see the absurdity of the human condition. I have many interests such as philosophy, literature, psychology and science, but I see them as a way of informing my artistic practice. Early on, I thought I wanted to be an experimental psychologist, then a criminal profiler (brought on by watching too much X-files in the 90s), then a photojournalist. But art was always something that I kept coming back to and I decided to commit to it. Zina Mussmann received a BFA from the University of Wisconsin-Milwaukee in 2002 and an MFA from Northern Illinois University in 2008. She has exhibited her work regionally and nationally. Her work has been featured in the Manifest International Painting Annual, The Alchemy Magazine of Literature and Art and Lunch Ticket Magazine. 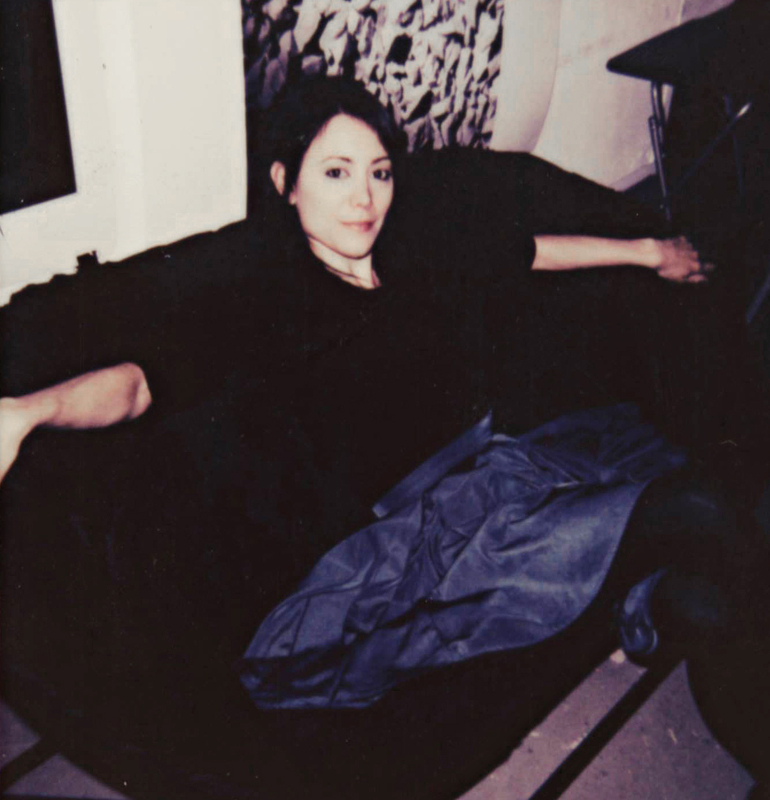 Zina is the co-founder of Greymatter, an artist-run space dedicated to showing conceptually driven and challenging work by local and national artists; and the curator of 365 Artists 365 Days. She is also a faculty member at the Milwaukee Institute of Art and Design where she teaches in the Foundations Department. My photo transfer work is about the complexity of stillness. When I think about what it means to be still and just be in your surroundings, there can be an uneasy feeling or conversely a tranquil feeling as well. I appreciate the subtlety of this experience and want to investigate it in my work. I keep the work within a vast open space and focus on one dense area to push the idea of stillness. The stillness can also be seen as isolation. I enjoy the photo transfer process and the unpredictable nature of it. I can have an idea of how the image will turn out and inevitably I will be way off. I’m a sculptor at heart, but have been making 2d work most recently. My grad-work was object/installation-based, where I would incorporate video. That was definitely a point of departure for me. My videos were short loops of small actions repeating, like a head turning or a hand writing the same sentence over and over. I continue to be interested in small moments and the impacts and possibilities of them. While on a trip with my mom I noticed we were going through a lot of tunnels. These were enormous tunnels that went through the sides of mountains. I took a number of photos as we went through them and as we exited. There was something very exciting to me about the possibilities that existed on other side of the tunnels. Would there be danger? Excitement? Beauty? Tragedy? I brought these images with me into the studio and started to produce photo transfers—a process that is in itself unpredictable. The resulting images are abstract dark spaces in a vast open white space where the uncertainty of a moment is frozen in time. My studio practice is chaotic, I tend to work in bursts as the ideas come. I don’t have a typical set schedule for when I work in the studio, rather I’m working on ideas, filming and photographing when an idea strikes. I don’t think I would’ve ever imagined I’d have an artist-run gallery space or be part of a project like 365. I have loved every minute of it. When my partner, Zina Mussmann, and I first rented our studio space it was not our intention to transform it into a gallery space. The building that we are in has a number of galleries and artist studios. We were asked to participate in an open studio event the building was having, and after taking part in a couple of these, we saw the possibility the space could have. We decided to reimagine the space and open it up for other artists to show. We now keep our studio practice in the back room and reserve the exhibition space for local and national artists. It has been a tremendously rewarding experience that I’m very glad we’ve taken on. A little bit of both, I have some set time in the studio. But, I mostly work as time allows. For a couple of years, my schedule has been erratic so I had to fit in time when I was able. This year I am freeing up more time so I can actually have a set studio schedule. That’s at least the plan for now. My work over the past five years has become more refined and minimalist. When I first start working with a different format or concept I tend to keep adding additional layers. It can be hard to pare down and just stop and edit a piece to only the essentials. I’ve decided I can say much more with empty space. Conceptually, I think I’m still working in the much the same direction. My work is still concerned with navigating the space between small actions. For example, a recent series of mine was filming a candle burning. At the time, I was so busy and being pulled in many different directions that I felt I really needed to just stop and not be distracted by anything. So, I filmed a candle burning from beginning to end. I forced myself to spend the time watching the flame flicker down the wick. It was a calming experience that I needed at the time. The resulting images that I produced are transfers from stills of the video. When you see the images, you only get the brief moments that I share, but there is so much that happens in the space between each image. It is these in-between spaces and the stillness that accompanies these experiences that interest me. My biggest influence would be my partner. We guide each other in right direction and help one another every step of the way. And since she’s also an artist she never sugar coats things for me, which I appreciate. Being part of the 365 project with Zina and Frank has been amazing. Seeing so much great work has had a profound impact on me as an artist. I think the biggest influence on me is just living and letting life happen. It’s when I’m not expecting an idea to come, or stressing over what I’m working on that my best ideas will come to me. And, I listen to a lot of Morrissey, and I’m sure has an impact on my work! Maybe that’s why the work has become more somber and sedate? Funny story about that. During high school, I procrastinated on deciding a theme for my studio art class that I had to explore for the entire year. When the time came to pick something I panicked and chose chairs. Well after spending a year making small metal chairs, I thought I might like to be a furniture designer. I’ve used chairs a bunch in my work and still continue to, but I never fulfilled that dream of becoming the next great furniture designer. Maybe someday I suppose, there’s still time. 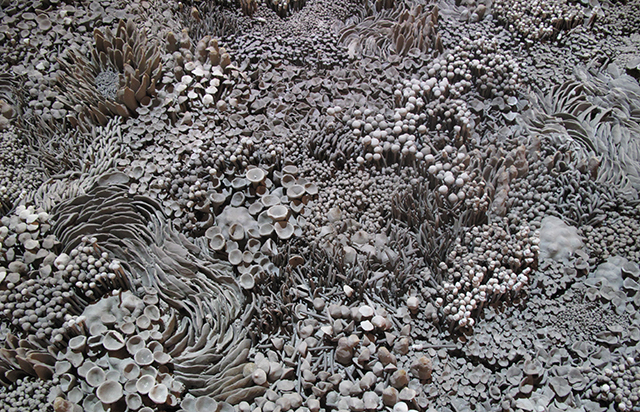 Rachel Quirk is an artist and co-directs the artist-run space, Greymatter Gallery in Milwaukee, Wisconsin. She received her Bachelors degree in Sculpture from the University of Wisconsin-Milwaukee and her Masters in Fine Arts-Sculpture from Northern Illinois University. She has exhibited nationally and is busy working on a new series. The paintings I create are visual recordings of how I see the world around me. My paintings are driven by a collection of certain things I feel can influence my work. In my studio I reduce those visuals into paintings with a minimalistic approach. Through this process I am able to bring what is important to the surface so that the viewer can interpret his/her own meaning. I am a Wisconsin artist, photographer, gallery owner, art educator, advocate, and community leader living and teaching in Sheboygan, Wisconsin. In 2005, I committed my life to expose, educate and engage others on the importance of experiencing and supporting the Visual Arts. Organizing local and regional art exhibitions, community art events, facilitating presentations, and supporting artists through professional development workshops, use of social media and networking has placed me in the forefront of advancing and promoting local artists and attracting regional and national artists to interact, collaborate, network and exhibit in the Sheboygan community. Engaging in various aspects of the art world has provided me ways to see my art through multiple lenses. When I create a painting what is the intent? Is it to deliver a certain message? Is it a way for me to work out what is happening inside my head? Is it more for my own personal growth? It is my way to distract myself from reality? I believe it is a combination of all. Being exposed to a variety of studio practices and processes provide me the opportunity to reflect on my own practice and try to make sense of what I am doing inside the studio. When I go to my studio I turn on the turntable, put on some jazz, open the laptop, get my cameras ready, do some organizing, throw a canvas on the wall, do some social media, grab a brush with paint, begin doing an underpainting consisting of random markings, put the brush down, check Instagram, go back to painting, take a few shots with my iPhone, edit, post on social media, continue to organize my studio, go back to painting. Repeat. You might get the impression that I am a bit A.D.D. Never been diagnosed, but I would say that I am. My practice is driven by what I am thinking at that particular moment. My time in the studio can range from a couple of hours to a full day. Regardless of the outcome I always leave my studio with an idea of where I would like to continue next time I go back. On a brighter note I have decided to take time off from running my gallery to spending more time in the studio. I once wrote, “painting is the only thing that makes me feel alive”. It is easy to forget this when your professional life is being stretched in multiple directions by your own doing. A few years ago I bought a book called, “The Artist’s Guide: How to Make a Living Doing What You Love “ by Jackie Battenfield. I came across an activity where she encourages artists to write their own obituary. It was through this activity that I started to think about what type of legacy I would like to leave behind when I leave this earth. I knew that I wanted to commit my life to the only thing that has been a constant factor in my life and that was ‘art’. For the past decade, I have committed to advocate for the Visual Arts in Wisconsin and to support artists. About three years ago, my practice as a painter has slowly merged into the art of building art community, which has opened many doors to projects, opportunities, and programs. This has been such a great ride in bringing the local visual arts into the forefront in my community as well as to continue to nurture the visual arts throughout Wisconsin. The best time to make art is on Sundays. There is something magical about this particular day. It is so quiet. In the past five years I have noticed that my color palette has become more limited, final paintings have now become underpaintings flooded by a solid color, texture has found its way to the surface, the Exacto knife has become another tool for creating, and spray paint has now become another medium. I also have noticed that I am enjoying experimenting more with my work. The 365 Artists 365 Days Project has been part of my life for the past two years. What started as an ambitious project has now became part of who I am today. Publishing our daily artists has impacted how I view art today. Being exposed to the different types of processes, ideas, and media shared across the globe has continued to challenge me to think on how I can continue to move forward with my work. Working with Zina Mussman and Rachel Quirk on this project has been a rewarding experience both personally and professionally. Opening the channels of communication has allowed me to share my thoughts. A big thanks for Mary Dally-Muenzmaier for sharing our project to her audience via her blog, CricketToes and to the Wisconsin Art Education Association for selecting our project to be presented at the 2014 and 2015 annual art conference. I am pulled in different directions everyday. Perhaps it is because I have my hands into many fabulous things ranging from owning an art gallery to working on the 365 Artists 365 Days Project, designing artist-inspired lesson plans for the Midwest Artist Studios Project to publishing a quarterly art publication called Artdose Art Guide, teaching secondary art full-time to speaking at conferences, putting together an art e-newsletter called Frank & Co to networking with artists, and facilitating community art-based events to advocating for the Visual Arts and art education in Wisconsin. Regardless of how my time is divided it always comes back to why I decided to commit my life to art. Other interests that I have is to write to become an author, to continue traveling, studio visits, curating, and to become a resource for visual artists living in and out of Wisconsin. Frank Juarez is the art department chair at Sheboygan North High School. He is actively involved in local, regional, state, and national arts organization such as the Wisconsin Art Education Association, and the National Art Education Association. He has served as a board member in the following organizations: Milwaukee Artist Resource Network, Arts Wisconsin, and the Cedarburg Cultural Center. He is the founder/former director of the Sheboygan Visual Artists. In 2011, he has opened his first art gallery, EFFJAY PROJEKTS Gallery (now called the Frank Juarez Gallery), in Sheboygan. He has been presenting at local universities/colleges on the Business of Art | Art of Business. He founded two projects focused on contemporary art and art education called The Midwest Artist Studios and the 365 Artists 365 Days Project. Recently, he has been recognized as the 2015 Wisconsin Art Education Association Teacher of the Year. In 2016, he will be receiving the Wisconsin Art Educator Award at the National Art Education Association Convention in Chicago, Illinois. LtoR: Frank Juarez, Rachel Quirk, and Zina Mussman. Photo by Irma Roman. Frank, Zina, and Rachel would like to take this opportunity to say THANK YOU for following the 365 Artists 365 Days Project for the past two years. What began as a one-year project rapidly grew into two-years of highlighting artists from across the globe. It was great to see the artists’ enthusiasm through sharing our posts especially their own. Although this project is now coming to a close in the next few days we plan on keeping the site up & running. This project is too important to take offline. In addition, we are in the process of creating our 2015 Artist Database, which can be downloaded from here. We would like to conclude this project by highlighting our work as artists. Being gallerists is a rewarding experience, however, it is very important to us that we continue to make art. We encourage you to keep us posted on all of the fab things you are doing via facebook.com/365artists365days.